Free Shipping Included! 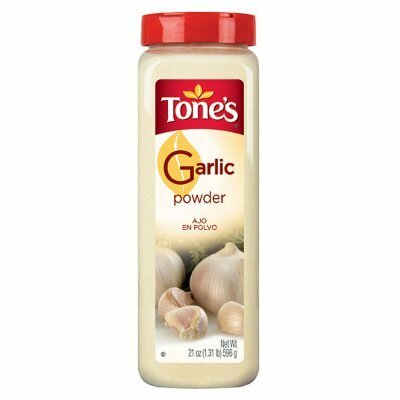 Tone's Garlic Powder - 21 oz. shaker (2 Pack) by Tone's at The Flavour Stack. MPN: 1413. Hurry! Limited time offer. Offer valid only while supplies last. Mix Tone's Garlic Powder with soft butter or margarine for an easy garlic spread or add it to mashed potatoes for delicious garlic mashed potatoes. Mix Tone's Garlic Powder with soft butter or margarine for an easy garlic spread or add it to mashed potatoes for delicious garlic mashed potatoes. One pound of garlic powder has the equivalent flavor of 5 lbs. of raw, finely minced garlic. 3/4 teaspoon Tone's Garlic Powder equals 1 Tbsp. fresh minced garlic. 1/4 teaspoon of Tone's Garlic Powder equals 1 whole garlic clove.